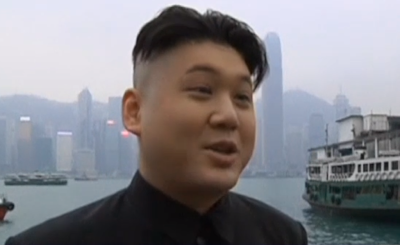 An Australian musician, who goes by "Howard" (and as yet has not disclosed a last name) recently created a buzz in Hong Kong, where he is dressed and was made-up in detail as Kim Jong-un, the Supreme Leader of North Korea. Perhaps a good PR stunt, at least initially, Howard has made a bit of a name for himself. In the brief interview included in the above video, Howard displays a valuable body language tell. Although we cannot see his feet, during the 0:23 - 0:24 segment, the impersonator goes "Up on his Toes" as he says, "... get dressed up and do some gigs with it ..." (Do not confuse this with the just preceding shoulder-shrugging). Although on some occasions this nonverbal signal can indicate an alpha emotional tone, in this case of the "Kimpersonator" and most other times, it signals excitement. It is one way the human body "bleeds out" excessive energy associated with these pleasant, high-energy (and high-adrenaline) states.